Homeowners often aspire to have attractive backyards that look like they belong in a magazine. While these can be picturesque and functional for adults, they may not be entirely practical for homeowners who have young children, especially when the majority of the yard is covered with paving stones or concrete. When young children are part of a household, homeowners may benefit by designing yards that are both functional and fun. Incorporating safe play areas for kids is one way to unlock the potential of both big and small backyards. As children run off to enjoy a playground, safety is the last thing on their minds. 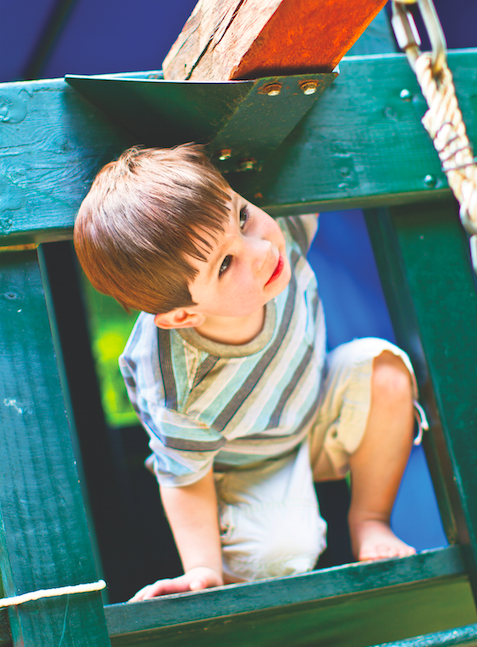 Kids are most interested in scaling ladders to treehouses or coasting down slides. That’s why adults must take it upon themselves to keep injury prevention in mind. SafestPlayground.com indicates that playground-related injuries routinely result in severe fractures, internal injuries, concussions, and dislocations. In the majority of playground injuries to children younger than age 5, the head and face are affected. Children between the ages of 5 and 9 experience more leg and arm injuries than younger kids. The Consumer Product Safety Commission states 70 percent of children’s injuries occur on home playgrounds. More than 28,000 children are injured each year on playgrounds across Canada, according to Parachute, a national injury prevention organization. When considering playground equipment for the yard, parents need to make safety a priority. The Canada Safety Society advises parents to follow the “5 S’s of Playground Safety”: Surface, structures, site, supervision, and safety. · Surface: Parents should assume that children will fall. To lessen the blow of falls, choose playground equipment with a perimeter of six feet of a softer surface, such as sand, pea gravel, rubber pieces or wood chips. This material should be between six and 12 inches deep. · Structure: The structure of the play equipment should be built from sturdy materials. Pressure-treated lumber was once the standard, but it’s not adviseable for kids’ playgrounds, as the chemicals used in the lumber can leach and young children may actually bite or pick at the wood. Use cedar or another wood that resists decay. Once the structure is built, inspect it frequently for damage. · Site: Look around the landscape for an ideal place to locate the playset. There should be no obstacles that children can hit while sliding or swinging. Avoid overhanging branches and do not place equipment too close to trees or fencing. Try to keep the set out of direct sunlight, which can make components heat up and scald young bodies. · Supervision: Do not leave children alone while they are playing. Prevent children from using the playset in an incorrect manner. · Safety: Follow the directions for installation. Make sure all posts are anchored into the ground securely. Railings should be spaced so that children cannot get stuck between them. Check that metal components have not rusted and that there is no additional excessive wear. Be sure that no tools or other dangerous items are left around the yard. Backyard playgrounds should be built with safety in mind. Learn the rules of play equipment and yard safety.